The flaugnarde or flognarde is a dessert I particularly adore cooking in winter! It is a specialty near my area in Limousin and more specifically of Corrèze. 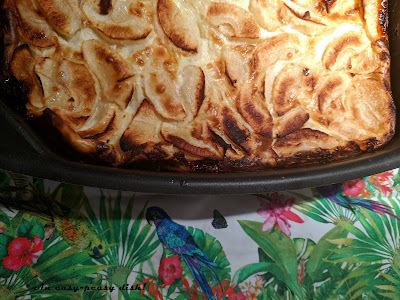 The flognarde whose name derives from the old French fleugne (soft, cozy) is simply the name given to a winter clafoutis when the fruits used are apples (or pears) instead of cherries. Wine pairing : Muscat de Rivesaltes (Sweet white) from Languedoc-Roussillon. In a pan, caramelized the apples with the butter and a little bit of brown sugar. Preheat your oven at 210 °. In a bowl, whisk the eggs and sugar. Incorporate the flour, corn flour, milk and rum. Butter and line a rectangular mould. Put the apples then pour in the dough. Once cooked, sprinkle the Flognarde with brown caster sugar. Préchauffez le four à 210 °. Dans un bol, fouettez les œufs avec le sucre. Incorporez la farine, le lait et le rhum. Beurrez et farinez un moule rectangulaire. Disposez-y les pommes et versez la pâte. A la sortie du four, saupoudrez de sucre roux.